Why He’s On Our Radar: There’s a reason so few films are made in Northern Alaska: it’s hard to access and it’s really cold. Any film that comes out of the region is poised to attract attention. Thankfully the latest one to hit theaters, “On the Ice” (opening February 17), from first-time feature filmmaker Andrew Okpeaha MacLean, is also a great film to boot. The thriller, based on MacLean’s award-winning short “Sikumi,” concerns two teenage boys living in an isolated Alaskan town who become embroiled in a web of lies and deceit following a tragic accident. The film premiered in the Dramatic Competition at last year’s Sundance Film Festival and went on to win multiple awards, including Best First Feature at the 2011 Berlinale. So tell me how you came into filmmaking, especially given how you grew up in the Alaskan town where the film’s set. I grew up pretty much entirely in Alaska, split between the community of Barrow, which is where we shot, and the town of Fairbanks, which is more of a mainstream kind of place. I grew up kind of half-in and half-out of the culture that dominated out there. I was a hybrid in a sense. I got into theater first, living in Seattle for a little while. I started a theater company, writing and directing plays as well as doing a little bit of acting. Then I moved back up home to Barrow for a variety of reasons. One of the reasons I wanted to go back up there was to learn to speak Inupiaq, the language, much better than I did. When I was there I started a theater company dedicated to doing shows entirely in the language. That was great. It was fun being home and being able to do shows in that environment and draw on that experience. But the audience base was pretty limited. We’d do a show and 400 of our relatives would come and that’d be it. And so I started thinking about film as something I could do that spoke to where I came from and who I am in a powerful way. I’d be able to reach audiences outside of my hometown. I looked into it and ended up applying to several film schools. One of the places I got in was NYU. I came out to New York and that was in 2002. I started there with no film experience. I’d never even seen a film camera. But I had the theatrical background to draw upon. That was kind of it. I learned there. The short that preceded the feature was my thesis film at NYU. There’s this theme running through your work – this need to lend a voice to the community you grew up with. Where does this passion stem from? You know, I think it’s because there are so many stories that haven’t been told from that part of the world. And yet, at the same time, our culture has a very strong presence in the popular culture. If you pay attention to these things, you start to notice you can’t really go two to three days without hearing some reference to Eskimos. Whether it’s a joke, whether it’s a commercial on TV, whether it’s some sort of plotline. For whatever reason, we occupy an extreme end of the human experience and people react to that. At the same time, it’s almost never us who are telling our own stories. I wanted to change that. That’s one of the things I have set out to do, both in theater and now in film. We need to get our own voice out there in the world. Indigenous communities are very plugged into the popular culture, we can’t help it. We download movies, we watch TV shows and we listen to music from outside. I think it’s time we start adding our voice and our culture into that mix in a more assertive kind of way. Does this feed into why, in adapting your short into a feature, you changed the setting to the present day? The short is a very different film. It’s more limited in scope with a simpler story. It’s set in the 1950s, back when people were still using dog teams to get around. The characters in it are adult men. It still deals with a lot of the same issues of violence and what that does to a community. But it was looking at a different time period. It wasn’t dealing in any way with that clash of cultures as the feature does. 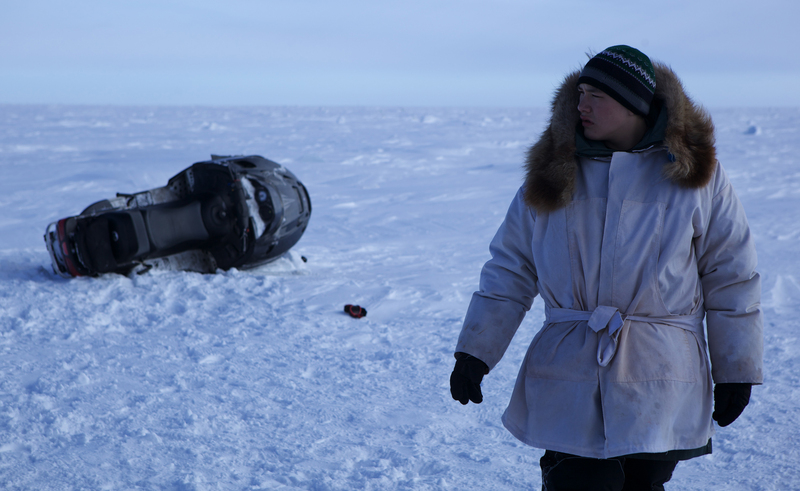 Were you also making a conscious effort to set your film apart from what is arguably the best-known Inuit film, “Atanarjuat,” set in the ancient past? I love “Atanarjuat.” I think that’s a fantastic film. But I wanted to do something different, in that I wanted it to be very contemporary story. “Atanarjuat” is awesome. It’s a necessary voice, but at the same time it’s a look at our past. It’s set pre-contact. There tends to be an assumption amongst audiences that that was somehow a more culturally legitimate time. Like we were somehow more pure then. I wanted to make something that’s a bit of an answer to that. Culture survives and cultures change and they don’t go away. We’ve adapted to the world that we’re in. We don’t live up to the stereotypes that people might have when they think of people living in igloos and out hunting, completely in tune with nature. I wanted to provide a more realistic portrayal of like — this is who we are. You probably get this question all the time, but can you speak to the challenges of making a film up there? It’s tough (laughs). There were a lot of things that made our lives difficult. It’s obviously such an isolated place, so the logistics of getting the equipment and the crew up there was pretty tough. We had to load everything up onto sleds and then drag it out there behind snowmobiles. We didn’t have enough snowmobiles; they were constantly breaking down. We had to keep a close eye on the weather conditions, which drastically affected our shooting schedule. We had to keep an eye out for polar bears. We had somebody on set whose job it was to watch out for polar bears. They had to have a rifle. That’s not something that every film set has to deal with.